He can stumble and bumble all game long as long as we win. I thought we decided he was not a baby, after all. If that is the worst thing he did, it was an impressive start. I expect him to make lots of freshman mistakes along the way. Not the worst thing he did. Zach Wilson could very easily be 3-0 as a starter. instead he's sitting at 1-2. such a frustrating team. i like Wilson, have been impressed by what i've seen, but that performance vs Boise exceeded all of my expectations for him on the road against a very good defense. and i put very, very, little blame, if any, on his shoulders for that debacle on what was ultimately (but didn't have to be) the last play of the game. Last edited by smokymountainrain; 11-05-2018 at 09:46 AM. 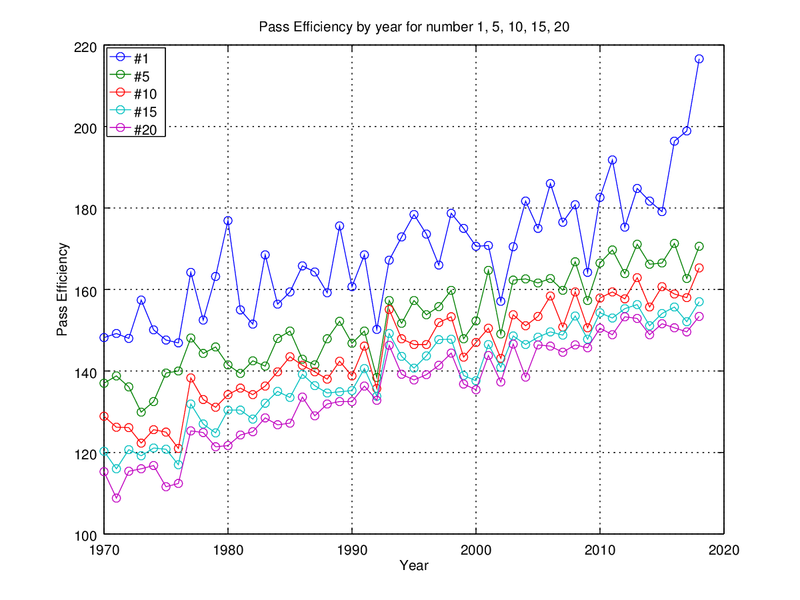 Zachs Pass efficiency is 144 right now. I would expect that to rise with the next 2 opponents. BYU has not had a qb over 150 since Max Hall in 2009. Tanners best season was his freshman year where he was at 136, his career is 115.Taysoms best season was 141 but he only played 4 games, his career was 121. Tanner had 182 attempts this year for 1082 yards and 5 tds (3ints), completed 61% of his passes even as captain checkdown. Zach has 80 attempts so far for 780 yards and 4 tds (2ints) completing 64% of his passes. those are crazy stats considering we are talking about a 25 year old senior and a true freshman. also, i heard/read somewhere that the three highest yards per completion of the season for byu QBs have come in Wilson's three starts. I used to be all over this stuff, but my knowledge has faded. Do they still use the same pass efficiency formula? Back in the day, 160 would be tops in the NCAA, in fact I think it was in the running for best season ever. Or maybe I'm remembering wrong. I just looked and there are two QB's over 200, 160 doesn't even make top 10, and 144 which seems like it used to be borderline top 10 in nation level, doesn't even put you in the top 40. Detmer's best season was 175 which i think was a record at the time. Next best was 168. Baker Mayfield's last two seasons were 196 and 198 which were both records. His sophomore season at OU was 173. Grimes saying Wilson was definitely told to throw it away if it wasn't there - apparently had the next play ready to go. So apparently he is to blame there, but doesn't change how i feel about the kid going forward. lot of optimism for ZW's future. My biggest, and perhaps only, complaint about Wilson so far is that he doesn't throw it away. Several of the sacks he took on Saturday were his fault for not getting rid of the ball. Having said that, it's a symptom of a young QB trying to be aggressive and make plays. Mangum was great at throwing it away. yeah, there is a middle ground there somewhere and he'll need to find that. you definitely like the general attitude of trying to make plays and i would hate to take that away (you don't want the mangum extreme), but sacks can be killers and 7 is too many - though the Oline has to be better as well. Love the new thread title!! I’m on the Zach train. Dude is a stud and I love that we get him for the next couple years. Thank you. My knowledge is kind of stuck in the late 90's, early 00's. Compared to then, pass rating has definitely trended up. Great has moved from 150 to 160 and good has moved from about maybe 130 to 145.
this is interesting, but i will point out that the current season isn't over - it skews the end of the graph a bit. Currently, Kyler Murray and Tua Tagovailoa are at 216 and 215 respectively. however, the last three weeks Tua's PER has been below his current mark and Murray is coming off a 160 rating game. IOW, while those guys are almost literally off the charts currently, i'd be surprised if they can keep up that pace as remarkable as they have each been this year. I'm all in on Zach. I love him more than Andre Ware. this reminds me of a stat pet peeve i have. guys who should know better, for example Mike Golic, Kyle Gunther or Hans Olsen who don't understand the difference between NFL standards and college standards. I've heard each of these guys mention 5+ ypc for RBs being very good for college running backs. 5 ypc would put you at 130th in the country among qualified running backs - there are only 126 D1 teams. to be considered good, you want to be at at least about 6+ which would put you near the top 50 in the country. by comparison, there are 9 qualified in the NFL who average 5+. that is a very good average in the NFL, not so much in college. Last edited by smokymountainrain; 11-05-2018 at 12:01 PM. He is decisive, accurate, mobile, throws a catchable ball. He needs to throw the ball away instead of taking sacks and needs some better play-calling and that’s about it. I’m all in! There was a twitter discussion last week that got shut down for being déclassé, but essentially folks said that ZW is not LDS, which was surprising to me. Good, I don't want him ruined by a mission. know who else weren’t mormons? mcmahon. sark. detmer. This is good. It's clear that God no longer favors BYU. My guess is that God much more enjoys the company of agnostics. So much paradox in this post. Zach is LDS. Not planning a mission. Phew! I'm glad we cleared that up. I was wondering whether the Draper-raised white kid from a prominent Mormon family and is attending BYU is, in fact, LDS.